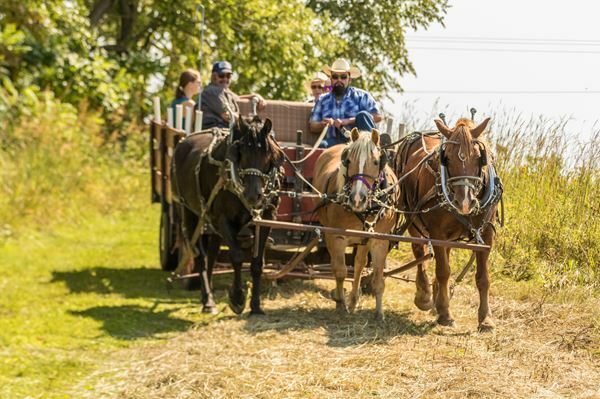 The friends of Schumacher Farm invite you to step back in time on the family farm in Dane County. We ask that you register for the walk so that we can communicate last minute information. ?Cancellation due to rain or excessive heat? I will send an email the evening before the walk with information about cancellatioin due to severe weather (wet, heat, etc.). This 40-acre farmstead with trails leading through a 10-acre prairie restoration project sits on a hilltop, with a view of the state capital, just east of Waunakee. The original farmhouse and barn built by Henry Schumacher in 1908 is accompanied by outbuildings of the same era, donated to the park from local farms. Unlike most of our walks, the Schumacher Farm Park will be an educational opportunity to learn about life in rural Dane County. We will explore the farmhouse and outbuildings and hear stories of life on the family farm. The trails are mowed 4-6 foot wide through a hilled prairie, around and through a woods. The walk has some moderate hills while the distance is 2 miles. We will stop often to hear historical and geographical information from a member of the Friends of Shumacher Farm Park. To preserve life ways of rural Dane County through education and restoration. Schumacher Farm Park is located on the top of a hill on County Hwy 19 just east of Waunakee, Wisconsin. Please park in the large lot off of Schumacher Road. From the East: We are across the highway from the Industrial park water tower, which you will see as you are coming into Waunakee on Hwy 19. Go past the Farm house on the right to the bottom of the hill and a stop signal; turn right at the intersection onto Q/Schumacher Road. Park in the large parking field on your right. From the West: Make the left turn at the intersection of Hwy 19 and Q/Schumacher Road. Make the first right into the large parking field on Schumacher Road. Handicapped parking is available next to the house. The house is not handicapped accessible by modern standards. There is an uneven stone walkway leading to the house, but there is also a wheelchair ramp. The grounds are grass with uneven footing. Please be careful!